This detailed map is double-sided for maximum coverage. The main map covers the area east of Rossall, from Fleetwood Farm eastward to Fleetwood Salt Works and the Ammonia Soda Works, both owned by the United Alkali Co and later part of ICI. Though this is a largely empty landscape, features include Burn Hall, Burn Naze Halt - a platform-less station opened in about 1908, the Preston & Wyre line plus the old direct line to Fleetwood (by 1909 called Burn Naze Siding). 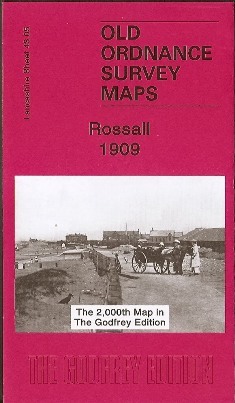 On the reverse is adjacent sheet 42.08 which covers Rossall School and also the northern part of Cleveleys. The map links up with Lancashire sheet 43.09 Thornton Cleveleys to the south.